From South Africa to Namibia with G Adventures: My review! Let me share my thoughts on the G Adventures tour through South Africa and Namibia from Cape Town to Windhoek. It’s not long after dawn in Etosha National Park and, even though the sun is shining brightly, there’s a chill in the morning air. For me, it’s almost too cold, and I pull my jumper tightly around my body. But for the animals here in the wilderness of Namibia, this is an important time of day. The overpowering midday heat that makes movement a chore is still hours away, so there’s lots going on. Animals are waking up and going to water holes to get something to drink; predators are watching the same water holes in case an easy breakfast presents itself; herds that move every day for safety are making the most of the first light; and scavengers are looking for the leftovers of any overnight attacks. For tourists like me, this is also an important part of the day because this is when we can see some of the best action. And I’m in luck! I’m with a couple of other members of my G Adventures group on the back of a safari vehicle and our driver has found lions. There are about half a dozen female adults and with them are two young cubs. 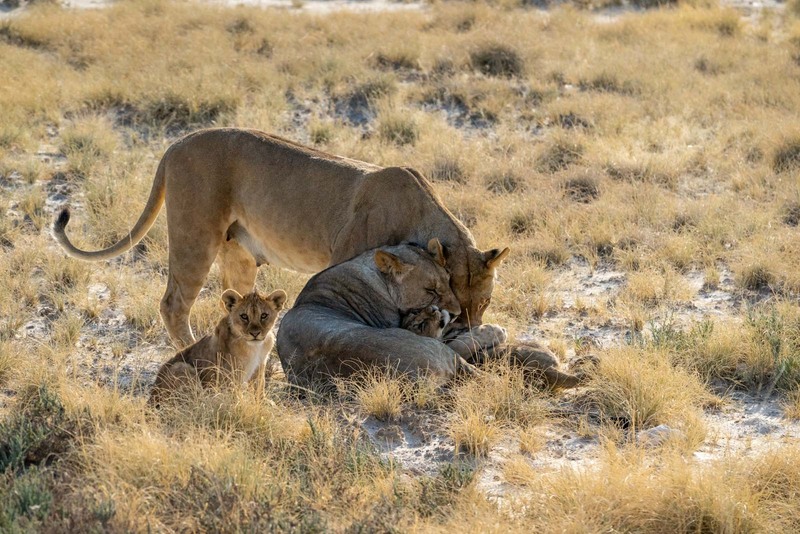 Under the watchful eye of their mother and the other lionesses, they play with each other, rolling around, pretending to bite, pouncing like kittens. And the whole time, I sit back and watch. Enthralled, amazed, and hardly able to believe the experience that I find myself a part of. This is surely going to be a highlight of my time in Namibia and this trip to Africa. For me, Africa has always been a bit of an unknown quantity. It’s a place I have spent the least time of all the continents (Antarctica excepted) and I don’t feel like I understand it well. If I’m to be completely honest, it scares me a bit. I’ve never been quite sure about how to organise a trip to Africa, how to plan the logistics, or what to expect once I arrive. There are lots of reasons I have put off a trip to Africa but, embarrassingly, the biggest reason is simply that I don’t know what I’m doing and it’s easier to go to parts of the world that I now understand much better. I know this all sounds a bit silly because, obviously, I had never been to any place until I went there. There’s always going to be a first time – and you just need to do it once and suddenly the mist of the unknown dissipates. But it’s why I was really excited when G Adventures suggested that my next trip as a G Wanderer should be to South Africa and Namibia. It seemed like the perfect way to learn more about Africa. I would be part of a tour – but there would still be a level of independence. Doing a safari in Etosha National Park may have turned out to be the highlight, but there has been plenty of build-up to this moment. Etosha is pretty much the last place we visit on the tour and I feel like with each new spot we see, things get even better. That’s not to say there has been anything wrong with the early destinations – my trip has been amazing right from the beginning. What I mean is that each time I think I have done something incredible, the next place on our tour takes it to an even higher level. The tour starts in the South African city of Cape Town. I think it makes a lot of sense to begin here for two reasons. Firstly, it’s a good transport hub so most people coming from around the world can easily get here by plane. But, secondly, it’s a city that’s easy to explore on your own. 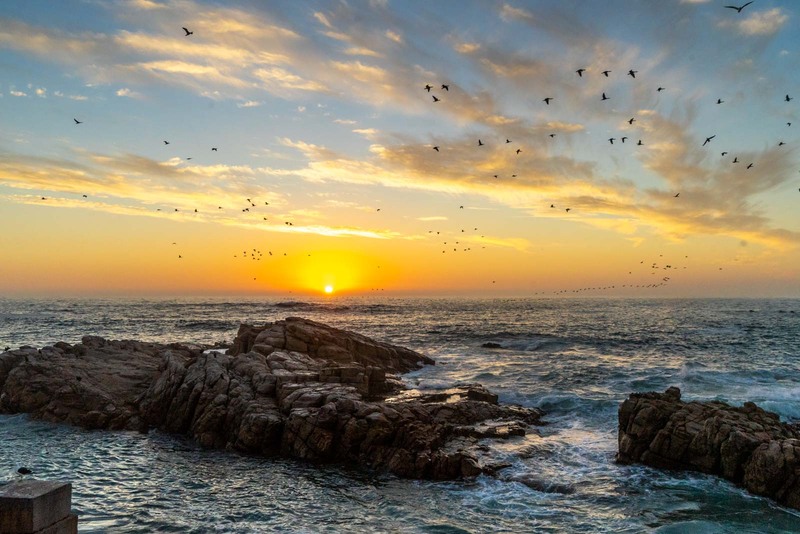 By starting the tour here, everyone can choose how many days early they want to arrive so they can spend some time seeing what Cape Town has to offer. Once the whole G Adventures group comes together, though, we quickly leave Cape Town and begin our journey up the west coast of Africa. The landscapes of the coast are striking and I stare out the window as we drive along in our bus. This time of year, colourful wildflowers are blooming along the side of the road and different hues flash as we speed past. We stop for the night at Lambert’s Bay, which gives me a good taste of the wildlife experiences that are going to be in store for the next ten days or so. 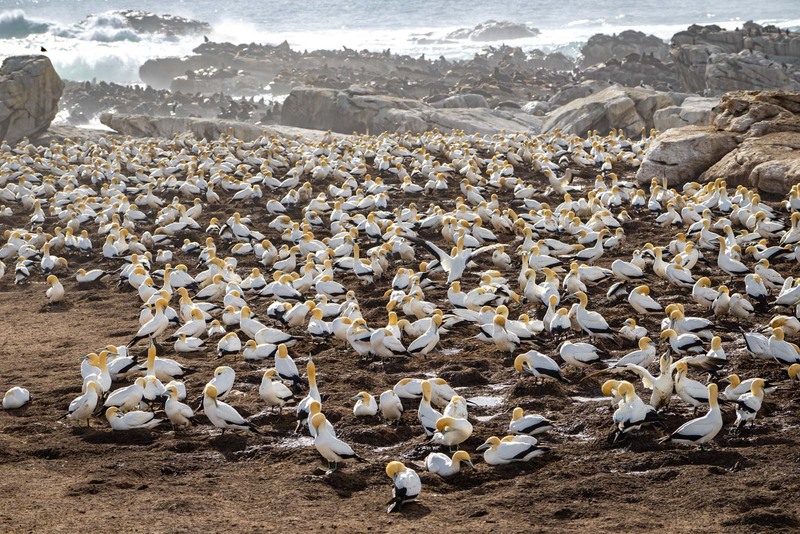 There’s a bird sanctuary here that is an important breeding ground for Cape gannets. A building for birdwatching has been constructed near the colony and we sit there for a while to watch as the birds squark and fly about. In the evening, a local wine tasting and seafood meal is a good chance to get to know the other people on my tour – as well as our tour leader (G Adventures calls them CEOs – Chief Experience Officers). For this trip, we’re being led by Bevern, who is from Zimbabwe. 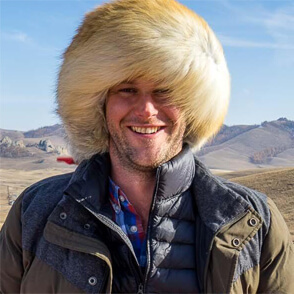 He’s been taking groups through southern Africa for years and is everything you would want in a guide: An expert in the places we visit, full of answers for all the questions we throw at him, helpful when issues arise, calm in every situation… and, as we’ll find out later, an excellent cook! We leave South Africa the next day. I’ve had some horror border crossings in my travels (I’m looking at you, South America!) so I didn’t quite know what to expect for the crossing from South Africa to Namibia. But, as well as being quite quick, it turns out to be one of the more spectacular. The Orange River forms the border between the two countries at this point and the checkpoints sit on either bank. After passing out of South Africa, we slowly drive across a bridge with water stretching out in both directions and a dramatic mountain range in the background. After quickly doing the paperwork on the Namibian side, it’s just a short drive to our accommodation. 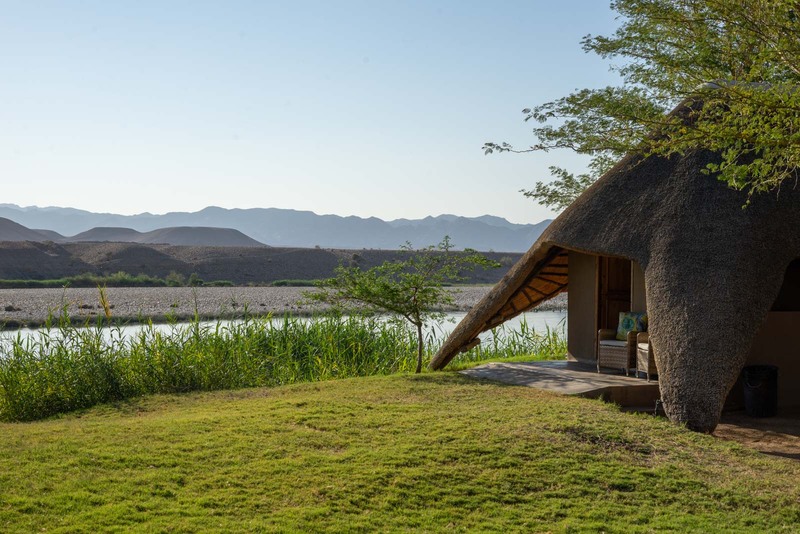 We spend the first night in Namibia in luxurious cabins right on the Orange River. Across the water is South Africa. It will be my last look at the country for now, as we head deeper into the country the next morning. 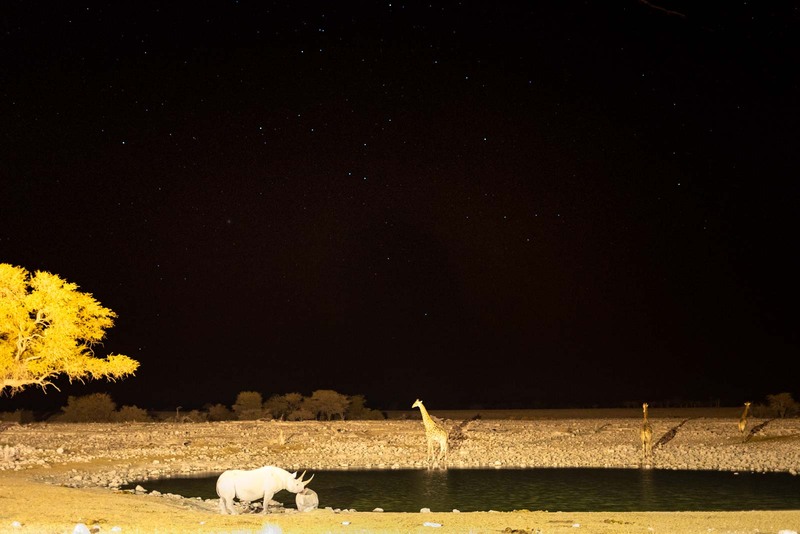 My time in Namibia will be defined by the nature that we see – diverse but always beautiful. And the first true taste is at Fish River Canyon. Fish River Canyon is titanic in proportions. Up to 160 kilometres long, up to 27 kilometres wide, and as much as 500 metres deep. It is the largest canyon in Africa and, by some definitions, the second-largest in the world. I stand on the edge of the canyon an look down. Far below me is a small river that is winding its way along the enormous stone path of the canyon. It bends around, like a snake crawling through the Namibian landscape. 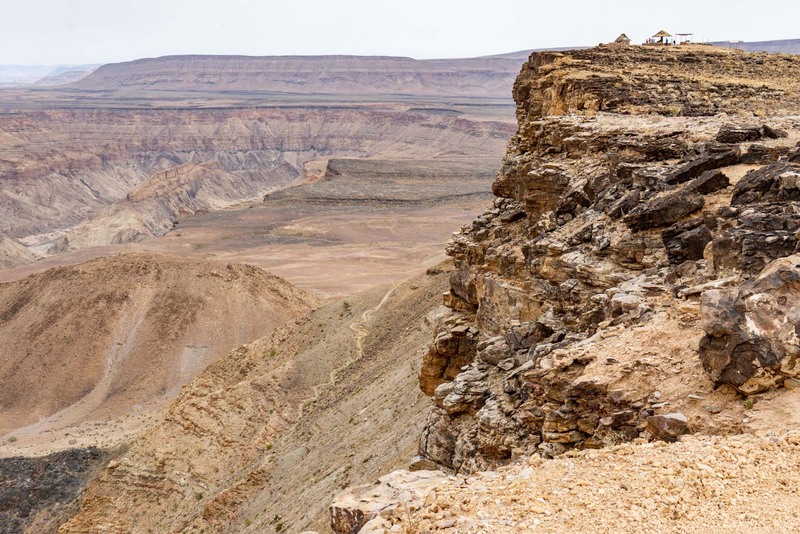 Walking along the top of Fish River Canyon, it can be hard to get a sense of its enormity. You know this is just a small part that you’re seeing – and even it seems endless. It’s quite a sight, particularly with the changing colours in the rocks. There are reds, oranges, purples… and even little flashes of green from the hardy drought-resistant plants scattered across the cliffs. 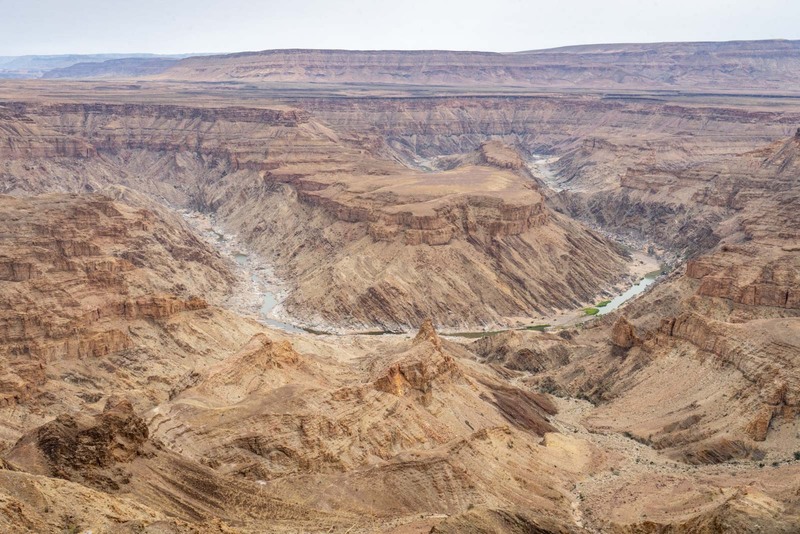 But if I think Fish River Canyon is dry – I haven’t seen anything yet. Next is pure desert. The most dramatic landscapes I will see in Namibia are here at Sossusvlei. This is the easiest part of the Namib Sand Sea to access and it’s like arriving on the surface of a foreign planet. The red and orange sand dunes roll on for kilometre after kilometre. The entire Namib Sand Sea is actually about 400 kilometres long and so, even though the scale is hard to fathom here, it’s nothing compared to what lies beyond. Experts think that the Namib Sand Sea is the oldest desert in the world. Again, it’s something that’s hard to get your head around. For me, I concentrate mainly on now it all looks – stunning imagery like I have never seen before. 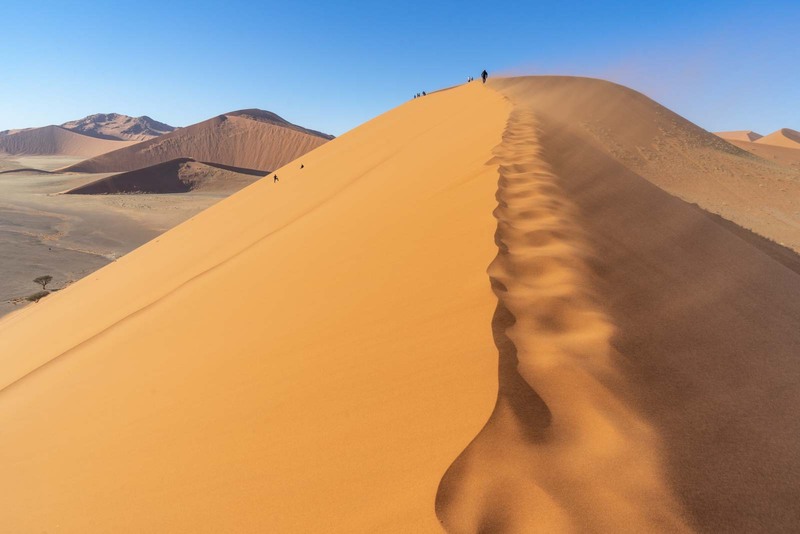 We have a whole day to explore the Sossusvlei and we start by climbing the impressive Dune 45. There are also the ancient dead trees that have been preserved for more than 700 years, a dried oasis, another impressive canyon, and more sand dunes everywhere you look. I have written a whole story about visiting Sossusvlei and I would encourage you to have a look at it to see even more. Sossusvlei is also the first place we take out the tents. Although we’ve been staying in hotels until now, it’s much more convenient to camp here – close to the action, underneath the stars. And what stars they are! Out in the desert, they shine so brightly at night, with the dense Milky Way streaking above from horizon to horizon. In the evenings, we sit around a fire and chat, eating a meal cooked by Bevern. It’s his grandmother’s recipe he tells us. Our next stop on this G Adventures tour through Namibia is a change of place. Swakopmund is a coastal city, where the sand dunes have been replaced by sandy beaches. This is the closest that Namibia comes to having a ‘tourist town’. 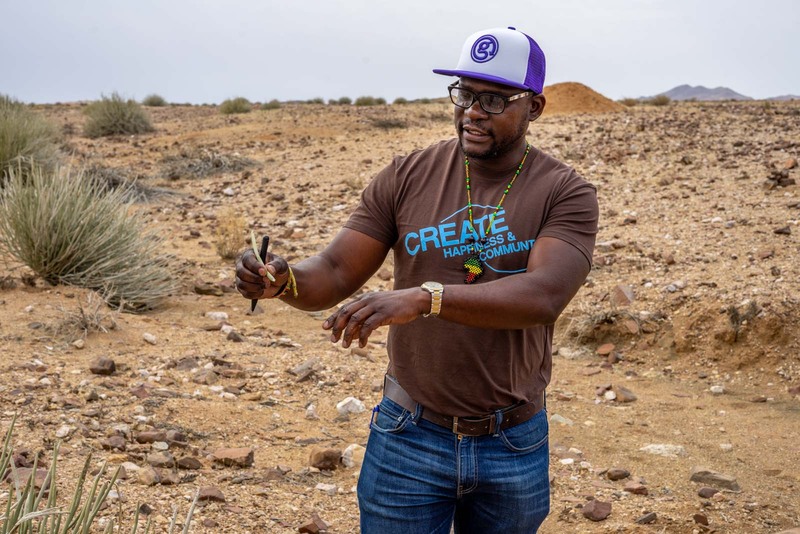 While the main industry of Swakopmund has historically been related to the nearby uranium mine (the largest opencast uranium mine in the world), tourism has boomed recently. 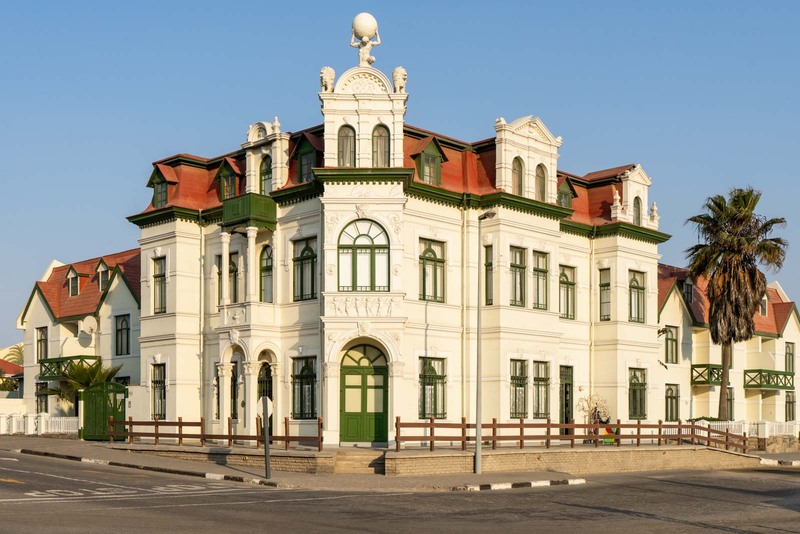 Part of the reason that Swakopmund is popular with tourists is because of its history as a German colony. The city is full of European architecture, restaurants, and bars. But for those who want to do something uniquely Namibian, the main activities (other than relaxing in town) use the natural scenery as a stage for adventure. While you can do sand boarding, skydiving, mountain biking, kayaking, or quad biking (and much more), I choose to head out on a boat trip to see some wildlife. 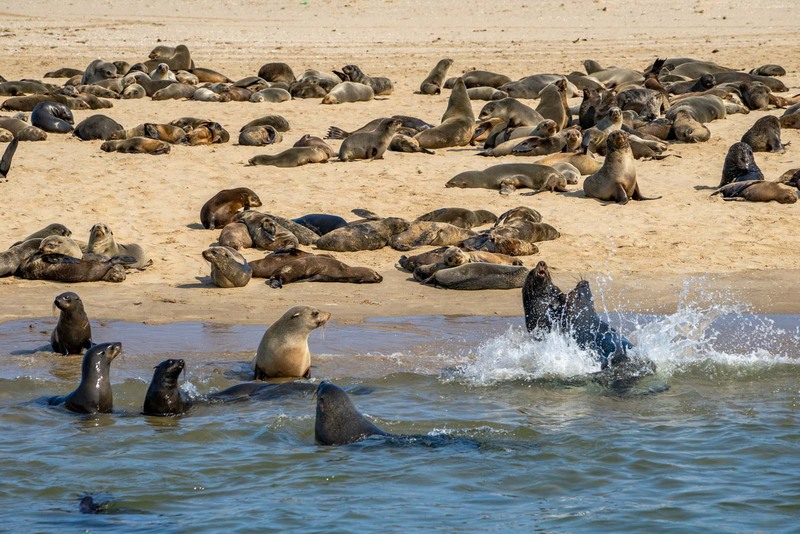 There are almost 100,000 seals living in huge colonies around Swakopmund during the breeding season. Even before we reach the beach where most of them are, we see some swimming in the water. One even jumps up onto the boat. 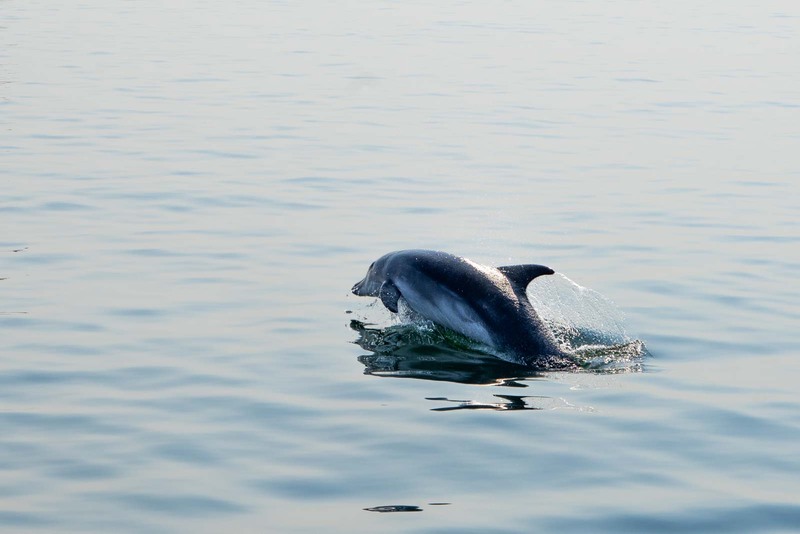 As we sail along, dolphins come and swim next to the boat and dive through the water. A pelican comes to land on the deck, and other birds float in the air above. It’s quite incredible to get so close to the animals and I make myself stop for a moment to appreciate how special this is. A trip like this through Namibia offers moments that you couldn’t imagine. 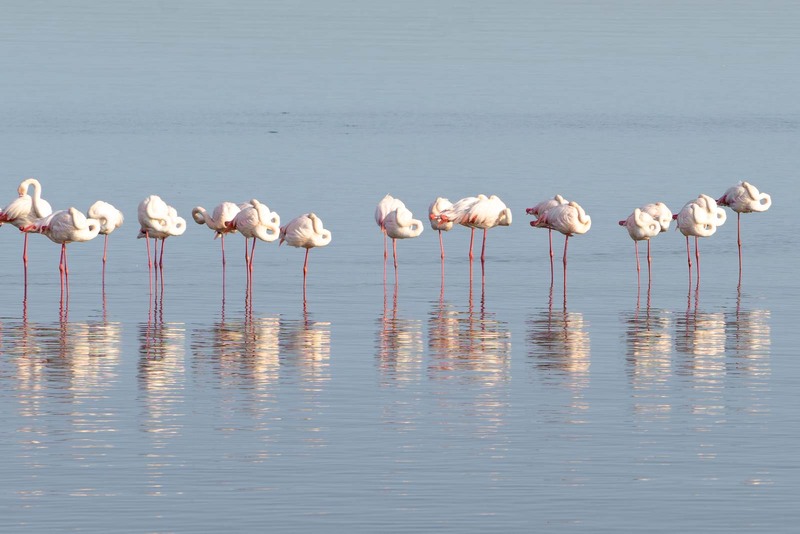 Even driving back to our hotel in Swakopmund after the boat trip finishes, a huge flock of flamingoes standing in the water offers another unique experience (and photo opportunity). 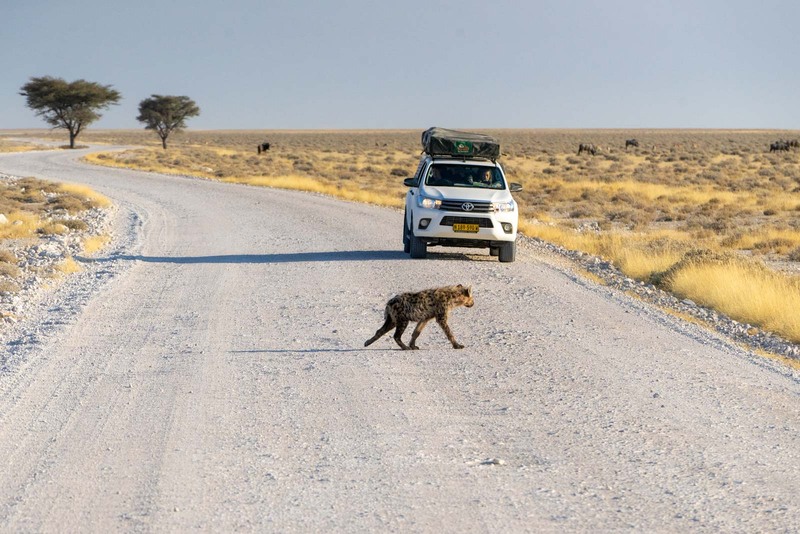 The most special of these encounters with the animals come at the next stop, Etosha National Park. I’ve already mentioned the pride of lions that we saw on a morning safari – but there is so much more here than that. On a full day safari through the national park, we see everything that the rangers told us to expect. There are the large herds of zebras and springboks, and there are also kudus and oryxes. We see the majestic elephants and the shy giraffes, and I spot wildebeests and a hyena. And then there is the most famous of the park’s residents – the black rhinos – that we see several times during our stay. 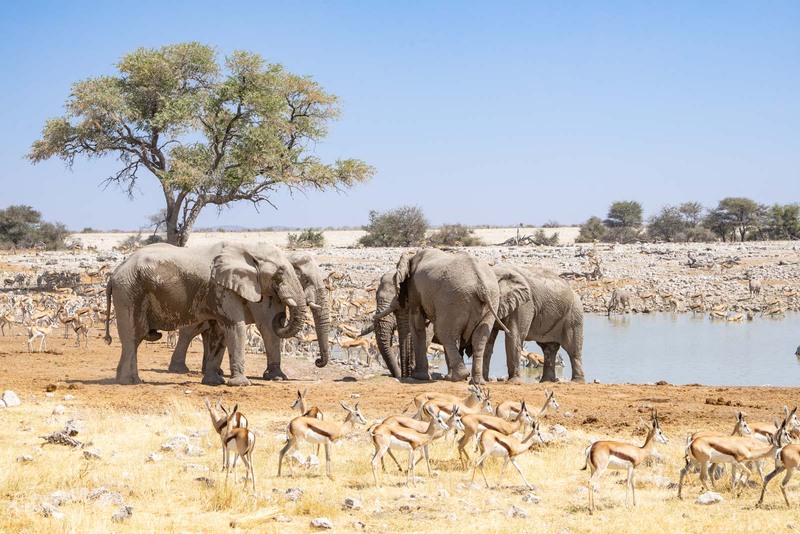 One of the things that is so special about Etosha National Park is the Okaukuejo Waterhole, which is right next to the secure area where all the accommodation is. We’re camping again and the waterhole is about 100 metres from my tent. During the night it is slightly illuminated and I can go over and watch the animals come to drink under the stars. Spending a few days camping during this trip turns out to be much more enjoyable than you might expect. Although it’s obviously not luxurious, it’s appropriate for the locations where we do it – in national parks and surrounded by nature. The trip is one of G Adventure’s ‘Classic’ tours. That means it’s a bit more upmarket than it’s backpacker-style ’18 to thirty somethings’ tours, but not as luxurious as its ‘National Geographic journeys’ tours. It’s the kind of trip I enjoy – a mixture of styles. Most nights are in hotels where you can have comfortable pillows and a hot shower in the morning. But there are a few days of camping that allow you to get closer to the country. 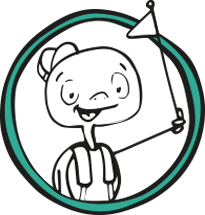 It means that you’re looked after well the whole time but there are opportunities to do a bit of exploring on your own or choose between different activities at some of the stops. And although the main destinations that I’ve talked about are certainly the highlights, part of the overall experience are the little things that you come across along the way. 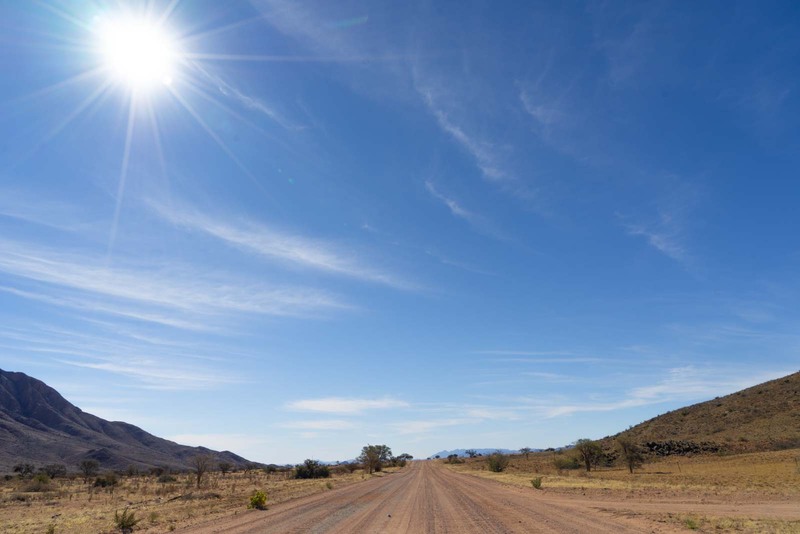 It’s about experiencing a border crossing in Africa, shopping the local supermarkets for lunch, crossing the Tropic of Capricorn in the bus, and eating famous apple pie at the tiny roadside town of Solitaire. This trip, for me, has been just a small taster of what the continent has to offer beyond the popular areas I have previously visited in Morocco, Egypt and South Africa. It has not just put my concerns about the unknown to rest, it has given me a new enthusiasm to see more. At Windhoek, I say goodbye to my group and to our leader, Bevern. He is continuing on with new people to Victoria Falls, through Botswana and Zimbabwe. I wish I was going to. 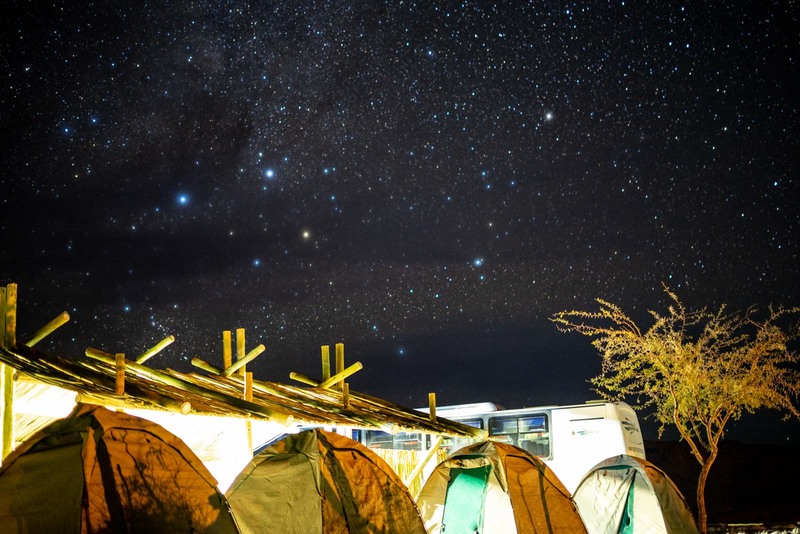 I travelled to Namibia with the support of G Adventures in my position as a G Wanderer. 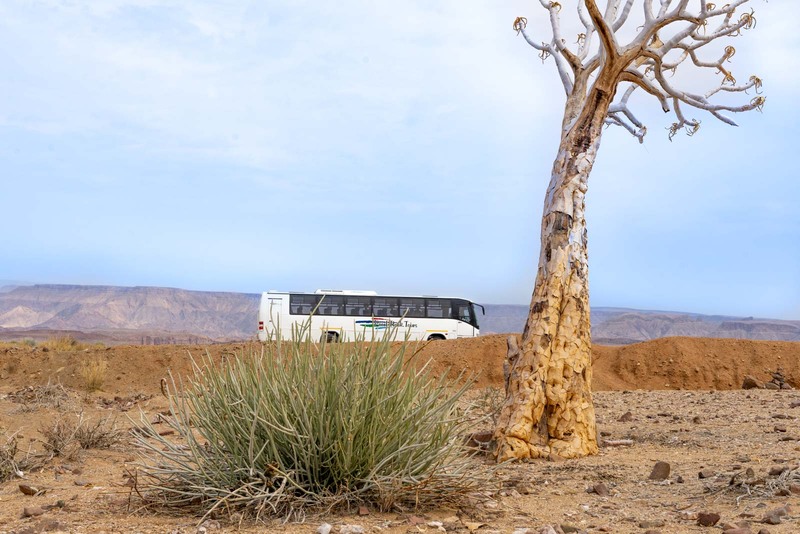 All the opinions expressed are my own – I truly believe G Adventures is one of the best tour companies that you can use for a trip to Namibia. Such a adorable post and article you write up! Nice adventure! Really fantastic pictures you captured in your travel trip. Lovely post.. Watching the wildlife at a close distance is a wonderful experience. There is a lot of learning here. 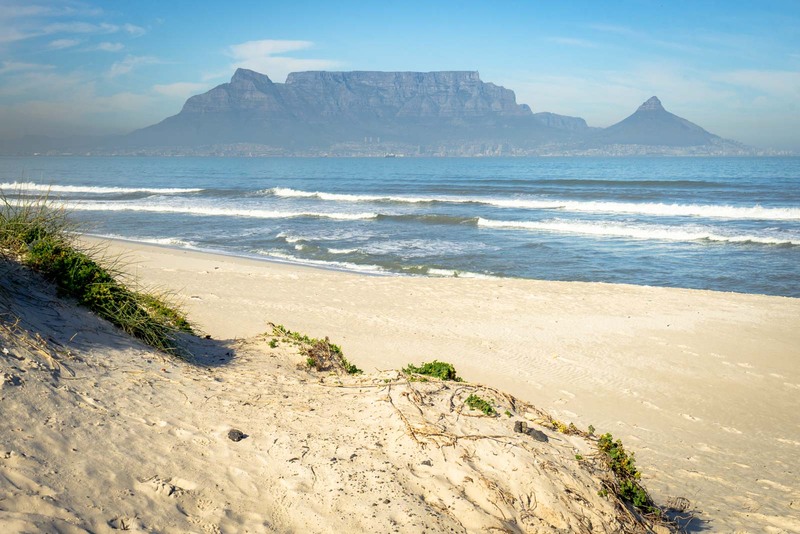 Wonderful Place to visit Thanks for sharing this travel experience with us, Table Mountain, one of the iconic landmarks of South Africa, is one of the oldest mountains in the world. I live in Joburg for six years now, and I’ve heard a lot about Namibia from travelers passing through here. 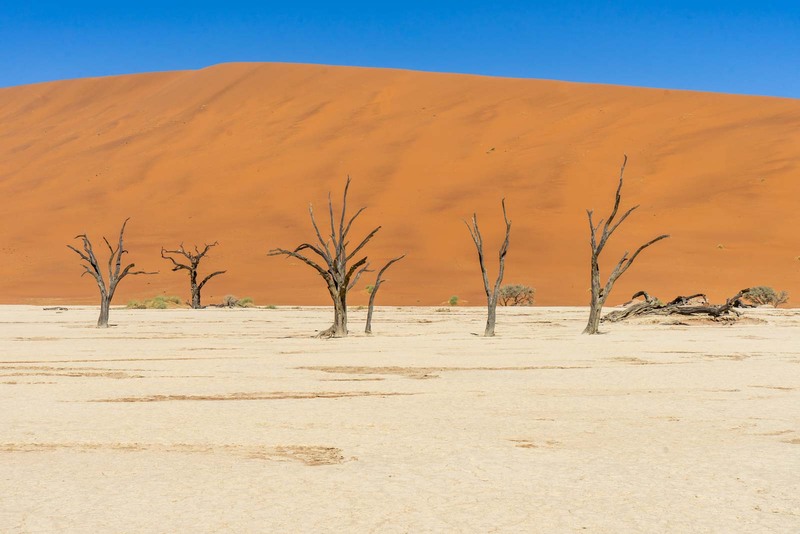 I’ve seen many beautiful pictures taken in Sossusvlei and in the Namibian desert. South Africa has a great many game reserves and and beautiful landscapes to offer. Nonetheless my belief is that one also needs to experience Namibia as well in order to get a more thorough picture of the continent. Thank you for the truly inspiring post.